Market perceptions are that CRE conditions have deteriorated in metro areas with a sizable economic dependence on the slumping energy industry. 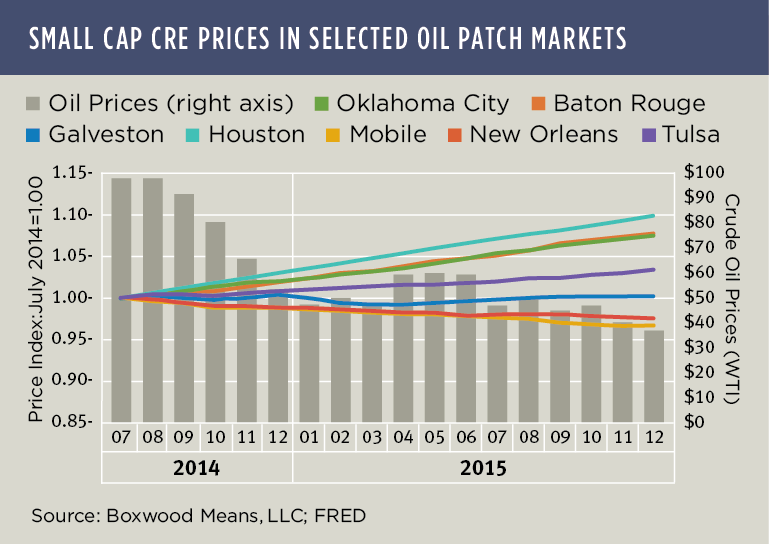 However, Boxwood's Small Commercial Price Index (SCPI) has yet to reveal any substantial across-the-board fallout for CRE in selected oil patch metros. While a couple of the smaller energy-dependent cities have shown a bit of weakness, generally speaking small commercial property prices in these markets proved to be buoyant during 2015. Oil prices have fallen from roughly $100/barrel to $33/barrel in the past 12 months. In previous oil slumps the drop in prices was devastating for the economies of many metro areas heavily concentrated in the energy sector. Along with that, property values were crushed. Lately, discussions have touted the benefits of growing economic diversification for some oil patch metros. Yet the magnitude of the recent decline in energy prices has been simply enormous and, regardless of the diversification achieved, we might still expect plunging oil prices to exact its own 'price' on the real estate markets. As you can see from the nearby graph, so far it's been a mixed bag of outcomes for small cap CRE prices as oil prices (West Texas Intermediate crude) cratered over the 18-month period. (Note in the graph that scales for the two vertical axes show very different ranges of value. Property prices moved in a fairly narrow band over the period while oil prices dropped precipitously.) Small cap CRE prices in three of the seven metros declined slightly during 2015 including Mobile (-2.3%), New Orleans (-1.4%) and Galveston (-0.2%). These are all relatively smaller populated cities. Annual returns for the remaining and mostly bigger cities have all been positive and led by Houston (6.7%), Baton Rouge (5.7%), Oklahoma City (5.3%) and Tulsa (2.6%). There is corroborating evidence for this apparent market stability. CRE space market fundamentals were steady during 2015 in the face of energy market deterioration. Despite a modest uptick in general office vacancies in some of the metros such as Houston, Tulsa and Baton Rouge - increases largely resulting from an upturn in office building deliveries - office net absorption and rents remained in positive territory according to CoStar's fourth quarter data. Moreover, the industrial sector in nearly all of these oil patch markets ended the year on a strong note. In addition, residential housing prices through October of last year (the latest data period available) exhibited no signs of softening, ranging from 2.0% annual home price growth in Mobile to 7.4% in Houston according to U.S. Federal Housing Finance Agency data. Boxwood's small cap CRE price trends in these oil patch markets seem to contrast with general perceptions about where these markets stood at year's end. Granted, property prices in three smaller markets dipped and office fundamentals in a couple have softened up. In the coming months our research and other real estate-related data may unanimously confirm sinking expectations for the group, but as of fourth quarter real estate market conditions have offered up few clues.